A rock is a naturally occurring aggregate of minerals and mineral-like substances called mineraloids. Rocks are classified as igneous, sedimentary, and metamorphic, based on their mineral and chemical composition, the texture of the constituent particles, and the processes that formed them. The study of rocks is called petrology. The Earth's crust (including the lithosphere) and mantle are formed of rock. The crust averages about 35 kilometers in thickness under the continents, but it averages only some 7-10 kilometers beneath the oceans. The continental crust is composed primarily of sedimentary rocks resting on crystalline "basement" formed of a great variety of metamorphic and igneous rocks, including granulite and granite. Oceanic crust is composed primarily of basalt and gabbro. Both continental and oceanic crust rest on peridotite of the Earth's mantle. Igneous rocks are formed when molten rock (magma) cools and solidifies, with or without crystallization. The word "igneous" is derived from the Latin ignis, meaning "fire." This class of rocks make up approximately 95 percent of the upper part of the Earth's crust, but their great abundance is hidden on the Earth's surface by a relatively thin but widespread layer of sedimentary and metamorphic rocks. Over seven hundred types of igneous rocks have been described, most of which formed beneath the Earth's surface. Igneous rocks are divided into two main categories: plutonic and volcanic rocks. Plutonic (or intrusive) rocks are produced when magma cools and crystallizes slowly within the Earth's crust. Volcanic (or extrusive) rocks are formed from magma reaching the surface either as lava or fragmental ejecta. Intrusive igneous rocks usually take a few thousand years to cool, whereas extrusive igneous rocks take only a few days or weeks to cool and solidify. Plutonic rocks are named after Pluto, the ancient Roman god of the underworld. Volcanic rocks are named after Vulcan, the Roman name for the god of fire. The Earth's mantle immediately below the crust typically is relatively rigid, and this part of the mantle and the overlying crust comprise the lithosphere. Below the lithosphere, the higher temperature causes the mantle to become less rigid and undergo convection, although it is completely or mostly solid. This convecting mantle makes up the "asthenospheric" mantle and is the source of much magma. Most magmas are generated at temperatures between 600 and 1,600 °C. Most of the higher-temperature magmas (between about 900° and 1,600 °C) are formed in the upper 200 kilometers or so of the mantle. Rocks may melt in response to a decrease in pressure, an increase in temperature, a change in composition (such as addition of water), or a combination of these processes. Other mechanisms, such as melting from the impact of a meteorite, are less important today, but such impacts led to extensive melting during formation of the Earth. Intrusive igneous rocks are formed from magma that cools and solidifies within the earth. Surrounded by pre-existing rock (called country rock), the magma cools slowly, and as a result these rocks are coarse-grained. The mineral grains in such rocks can generally be identified with the naked eye. Intrusive rocks can also be classified according to the shape and size of the intrusive body and its relation to the formations into which it intrudes. Typical intrusive formations are batholiths, stocks, laccoliths, sills and dikes. The central cores of major mountain ranges consist of intrusive igneous rocks, usually granite. When exposed by erosion, these cores (called "batholiths") may occupy huge areas of the surface. Extrusive igneous rocks are formed at the Earth's surface as a result of the melting of rocks within the mantle. The melted rock (magma) rises because of contrasting density with the surrounding mantle. When it reaches the surface, magma extruded onto the surface (beneath water or air) is called lava. Eruptions of volcanoes under the air are termed subaerial; those occurring beneath the ocean are termed submarine. Black smokers and mid-ocean-ridge basalt are examples of submarine volcanic activity. Magma that erupts from a volcano behaves according to its temperature and composition, and it therefore has highly variable viscosity. For example, high-temperature magma, usually basaltic in composition, behaves like thick oil, and, as it cools, treacle. This forms pahoehoe-type lava. Felsic magma, such as rhyolite, usually erupts at relatively low temperature and is up to ten thousand times as viscous as basalt. These volcanic eruptions rarely form lava flows, and usually erupt explosively, with the release of gases (such as carbon dioxide) trapped in the magma. Because lava cools and crystallizes rapidly, it is fine-grained. If the cooling occurs so rapidly as to prevent the formation of even small crystals, the resultant rock may be a glass (such as the rock obsidian). Given this fine-grained texture, it is much more difficult to distinguish between the different types of extrusive igneous rocks than between different types of intrusive igneous rocks. Igneous rock are classified according to their mode of occurrence, texture, mineralogy, chemical composition, and geometry of the igneous body. The classification of the many types of different igneous rocks can provide us with important information about the conditions under which they formed. Two important variables used for the classification of igneous rocks are (a) particle size, which largely depends upon the cooling history, and (b) mineral composition of the rock. Feldspars, quartz, olivines, pyroxenes, amphiboles, and micas are all important minerals in the formation of igneous rocks, and they are basic to the classification of these rocks. Other minerals present are regarded as "accessory" minerals. In a simplified classification scheme, igneous rock types are separated on the basis of (a) the type of feldspar present, (b) the presence or absence of quartz, and (c) the type of iron or magnesium minerals present (if the rocks contain no feldspar or quartz). Rocks containing quartz (silica) are "silica-oversaturated." Rocks with feldspathoids are "silica-undersaturated," because feldspathoids cannot coexist with quartz. Igneous rocks that have crystals large enough to be seen by the naked eye are called "phaneritic"; those with crystals too small to be seen by the unaided eye are called "aphanitic." Generally speaking, phaneritic implies an intrusive origin; aphanitic, an extrusive one. Crystals embedded in fine-grained igneous rocks are termed "porphyritic." The porphyritic texture develops when some crystals grow to considerable size before the main mass of the magma consolidates into finer grained, uniform material. Texture is an important criterion for the naming of volcanic rocks. The texture of volcanic rocks—including the size, shape, orientation, and distribution of grains and the intergrain relationships—will determine whether the rock is termed a tuff, a pyroclastic lava, or a simple lava. The texture, however, is only a subordinate part of classifying volcanic rocks. Classification of these rocks is based primarily on their chemical composition. In the case of plutonic rocks, textural criteria are less critical for classification purposes, for at least two reasons. First, these rocks tend to be less varied in texture, and second, their mineral contents are often readily determined—visible to the naked eye or with the aid of a lens or microscope. Thus, mineralogical classification is used most often to classify plutonic rocks, and chemical classification is preferred for volcanic rocks. Their minerals and global chemistry provide information about the composition of the mantle from which some igneous rocks have been extracted, along with the temperature and pressure conditions under which this extraction took place. Their ages can be obtained from various methods of radiometric dating. When compared with the ages of adjacent geological strata, they help construct a time sequence of events. Their features are usually characteristic of specific tectonic processes, allowing reconstitution of these processes. Under special circumstances, they contain important mineral deposits (ores). For example, tungsten, tin, and uranium are commonly associated with granites; ores of chromium and platinum are commonly associated with gabbros. Sedimentary rocks cover 75 percent of the Earth's surface and include common types such as chalk, limestone, sandstone, clay, and shale. They are formed at or near the Earth's surface in three main ways: (a) deposition of the weathered remains of other rocks (known as "clastic" sedimentary rocks); (b) deposition of the results of biogenic activity; and (c) precipitation from solution. These processes are followed by compaction of the particulate matter and cementation. The sedimentary rock cover of the continents of the Earth's crust is extensive, but the total contribution of sedimentary rocks is estimated to be only five percent of the total. As such, the sedimentary sequences we see represent only a thin veneer over a crust consisting mainly of igneous and metamorphic rocks. The formation of sedimentary rock begins with the deposition of particles carried by water, wind, and glaciers to form sediment. As the sediment builds up, pressure from the overburden ("lithostatic" pressure) squeezes the sediment into layered solids, and the liquids in the pores are expelled. This process is called "lithification" (rock formation). The term "diagenesis" is used to describe all the chemical, physical, and biological changes (including cementation) that a sediment undergoes after initial deposition and during and after lithification, excluding surface weathering. Given their manner of formation, sedimentary rocks contain important information about the Earth's history. In particular, they contain fossils, the preserved remains of ancient plants and animals. Unlike most igneous and metamorphic rocks, they form at temperatures and pressures that do not destroy fossil remnants. The composition of sediments provides clues about the original rock. Differences between successive layers indicate changes to the environment that occurred over time. 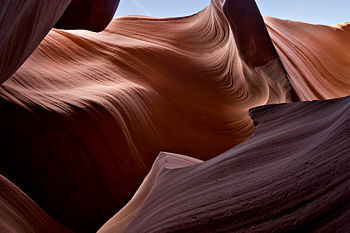 Lower Antelope Canyon in Arizona was carved out of the surrounding sandstone by both mechanical weathering and chemical weathering. Wind, sand, and water from flash flooding are the primary weathering agents here. Clastic sedimentary rocks are composed of discrete fragments or "clasts" of materials derived from other rocks. They are composed largely of quartz, with other common minerals including feldspars, amphiboles, and clay minerals. Sometimes there are more exotic igneous and metamorphic minerals. Clastic sedimentary rocks may be considered according to their grain size. Shale consists of the finest particles, smaller than 0.004 millimeters; siltstone has slightly bigger particles, between 0.004 to 0.06 millimeters; sandstone is coarser still, with grain sizes of 0.06 to 2 millimeters; and conglomerates and breccias are the coarsest, with grains between 2 and 256 millimeters. Arenite is a general term for sedimentary rock with sand-sized particles. All rocks disintegrate slowly as a result of mechanical and chemical weathering. Mechanical weathering is the breakdown of rock into particles without producing changes in the chemical composition of the minerals in the rock. Ice is the most important agent of mechanical weathering. When water percolates into cracks in the rock and freezes, it expands. The force of expansion widens the cracks and breaks off pieces of rock. Heating and cooling of the rock, and its resulting expansion and contraction, also aids the process. Chemical weathering is the breakdown of rock by chemical reaction. In this process, the minerals in the rock are changed into particles that can be easily carried away. Air and water are both involved in many complex chemical reactions. Biogenic sedimentary rocks contain materials generated by living organisms. They include carbonate minerals such as corals, molluscs, and foraminifera, which cover the ocean floor with layers of calcite that later forms limestone. Other examples include stromatolites, the flint nodules found in chalk (which is itself a biogenic sedimentary rock, a form of limestone), and coal (derived from the remains of tropical plants subjected to pressure). Precipitate sedimentary rocks form when mineral solutions, such as seawater, evaporate. Examples include the minerals halite and gypsum. The shape of the particles in sedimentary rocks has an important effect on the ability of microorganisms to colonize them. This interaction is studied in the science of geomicrobiology. It is thought that the relatively low levels of carbon dioxide in the Earth's atmosphere (compared to that on Venus) is due to large amounts of carbon being trapped in limestone and dolomite sedimentary layers. The transfer of carbon from eroded sediments to marine deposits is part of the carbon cycle. Sedimentary rocks are economically important in that they can be used as construction material. In addition, they often form porous and permeable reservoirs in sedimentary basins, in which petroleum and other hydrocarbons can be found. Metamorphic rock is the result of transformation of a pre-existing rock type, the protolith, in a process called metamorphism. The word metamorphism means "change in form," derived from the Greek prefix meta, "after," and noun morphe, "form." The protolith may be sedimentary rock, igneous rock, or an older metamorphic rock. Metamorphic rocks make up a large part of the Earth's crust. They are classified by texture and by chemical and mineral assembly. Some examples of metamorphic rocks are slate, gneiss, and schist. Minerals formed by the process of metamorphism include kyanite, staurolite, sillimanite, andalusite, and some garnets. Other minerals—such as olivines, pyroxenes, amphiboles, micas, feldspars, and quartz—may be found in metamorphic rocks but are not necessarily the result of the process of metamorphism. They were formed during the crystallization of igneous rocks. Metamorphic rocks are formed deep beneath the Earth's surface, when the protolith is subjected to heat (greater than 150 °C) and extreme pressures and stresses from the rocks above. These conditions lead to profound physical and chemical changes in the protolith. Metamorphic rocks are also formed by the intrusion of molten rock (called magma) into solid rock, forming particularly in the places of contact between the magma and solid rock where the temperatures are high. The transformation of one rock type to another is described by the geological model called the rock cycle. One important mechanism of metamorphism is that of chemical reactions that occur between minerals without melting them. In this process, atoms are exchanged between minerals and new minerals are formed. Many complex, high-temperature reactions may take place. Following long periods of erosion and uplift, metamorphic rocks become exposed to the Earth's surface. The study of these rocks provides us with valuable information about the temperatures and pressures that occur at great depths within the Earth's crust. Yet, the process of metamorphism may destroy the features that could have revealed the rock's earlier history, including the fossil record. Metamorphic rocks are separated into foliated and non-foliated categories. The layering within metamorphic rocks is called foliation. The term is derived from the Latin word folia, meaning "leaves." 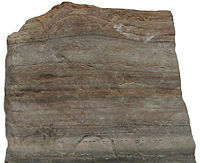 Foliated (or banded) rock is produced by stress that is greatest from one direction, thus deforming the rock in one plane. This causes growth of the platy or elongated crystals of minerals such as mica and chlorite. Rocks that were subjected to uniform pressure from all sides, or those that lack minerals with distinctive growth habits, will not be foliated. Nonfoliated rock does not have planar patterns of stress. Slate is an example of a very fine-grained, foliated metamorphic rock, while phyllite is coarse, schist coarser, and gneiss very coarse-grained. Marble is generally not foliated, which allows its use as a material for sculpture and architecture. Contact metamorphism is the name given to changes that occur when magma (molten rock) is injected into the solid rock (country rock) that surrounds it. Changes that occur are greatest wherever the magma comes into contact with the rock, because the temperatures are highest at this boundary and decrease with distance from it. 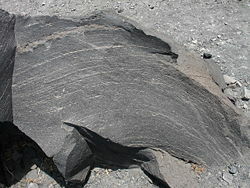 Igneous rock forms from the cooling magma, but around it is a metamorphosed zone called a contact metamorphism aureole. Regional metamorphism is the name given to changes in great masses of rock over a wide area, often within orogenic (mountain-forming) belts. The changes are caused by high temperatures and pressures in the depths of the Earth, and if the metamorphosed rocks are uplifted and exposed by erosion, they may occur over vast areas at the surface. Deer, W.A., R.A. Howie, and J. Zussman. 1996. An Introduction to the Rock-Forming Minerals. 2nd ed. Upper Saddle River, NJ: Prentice Hall. ISBN 0582300940 and ISBN 978-0582300941. Farndon, John. 2006. The Practical Encyclopedia of Rocks & Minerals: How to Find, Identify, Collect and Maintain the World's best Specimens, with over 1000 Photographs and Artworks. London: Lorenz Books. ISBN 0754815412 and ISBN 978-0754815419. Lambert, David, and the Diagram Group. 1998. The Field Guide to Geology. Updated ed. New York: Facts on File. ISBN 0816038236. Le Maitre, R. W., ed. 2004. Igneous Rocks: A Classification and Glossary of Terms. 2nd ed. New York: Cambridge University Press. ISBN 0521619483. Pellant, Chris. 2002. Rocks and Minerals. Smithsonian Handbooks. New York: Dorling Kindersley. ISBN 0789491060 and ISBN 978-0789491060. Shaffer, Paul R., Herbert S. Zim, and Raymond Perlman. 2001. Rocks, Gems and Minerals. Rev. ed. New York: St. Martin's Press. ISBN 1582381321 and ISBN 978-1582381329. This page was last modified on 15 July 2015, at 16:34.